My grandmother, Marian Fraser Arundel (known as Nina), was born in 1874 in India, the eldest daughter of Sir Arundel Tagg Arundel KCIS and Catherine Sim. Here siblings were Violet Harriet (known as Vi, who married Evelyn Norrie), Arthur Duncan Stuart, Edith Mary and Margaret Helen. Nina and her sisters. 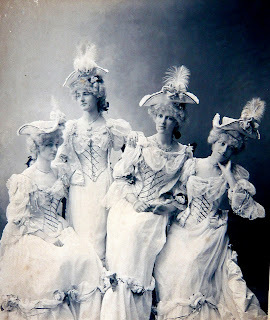 She is second from the left. She married Archie Pugh - later Col AJ Pugh CBE, VD on 18th December 1904 in Calcutta Cathedral. He was a solicitor in Calcutta and a member (and from 1912 Colonel) of the Calcutta Light Horse for 32 years. They had six children - Archie ((1908), Jimmie (1910), my mother Annette born in 1914, Ivor (1916), Michael (1918) and David (1922). The children were brought up mainly in Wales, at the family home at Cwmcodwig, Llanfarian. Their cousin Ruth Howard (born 1910) who remained a close friend all her life has written about their childhood in a short memoir here. An excerpt dealing with Nina and her family can be found here. Col Archie Pugh died in Wales in 1923, aged only 52. Nina remarried Sir Alfred Herbert KBE in September 1933 as his third wife and devoted herself to his business Alfred Herbert Ltd in Coventry and around the world and his estate at Dunley, in Hampshire. Step called her 'an angel' - and indeed she was a beautiful and gentle soul who loved poetry, knew Tagore and studied Ramakrishna and other great texts and became a Christian Scientist. This latter teaching caused the only arguments between Sir Alfred and Nina, when a doctor would be normally consulted but she demurred. After his death in 1957, she moved to Wadwick House (part of the Dunley Estate) with Mackenzie as housekeeper and other staff. She was accompanied everywhere by her spaniel 'Bramble'. In 1960, she opened the Herbert Art Gallery and Museum in Coventry as well as conducting a number of other civic duties, such as attending the reconsecration of Coventry Cathedral. She sadly suffered a stroke in 1963 and was nursed at home by two Sicilian nurses, Maria and Conchita until she died in 1967. She is buried in Wales.